French Feudal. Carolingian Immobilized issue of Charles the Bald for Maine, issued by Hugh II, ca. AD 970. The attribution for this issue this issue is that provided by me by Gordon Singer, with minor corrections.. His original tag will be included. Issuer : Hugh II, AD 955 to 992 (Gordon had Hugh I, but Hugh II is more likely). Size : 20.4 x 20.8 mm. Weight : 1.26 grams. Grade : VF, full strike, toned. Obverse : Karolus monogram with GRLTIL D REX around. 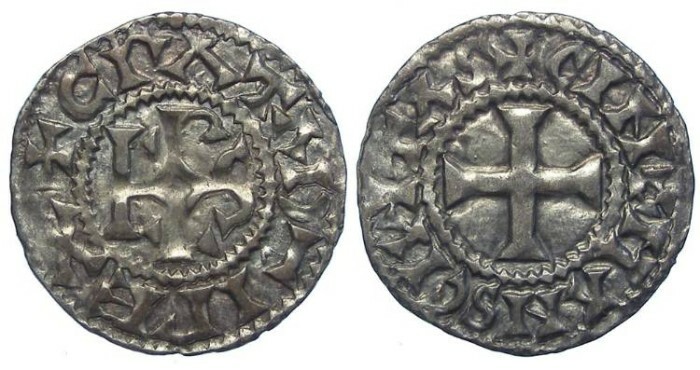 There are coins on this type issued by both Charles the Bald (see MEC #874) and Charles the Simple (see MEC #993 to 995), but they have finer engraving with the much narrower crosses on the reverse, and are struck to a standard of about 1.7 grams. This coin with it's lower weight, and courser style has to be slightly later, and because coins of this type were in the Fecamp hoard buried in AD 977, so they are now attributed to Hughes II ca. AD 970 as Count of Maine.